Three-year-old Aylan Kurdi died wearing the shoes his parents put on him for his long journey. His clothes were cared for. He was well-nourished. Obviously loved. His parents wanted him to grow up safe, not in a nation split by civil war and ruled by a tyrant. They risked everything to give him a better life. But he died. He died wearing the shoes his daddy bought him. While his parents struggled to take him somewhere safe, he drowned. He died in the arms of his mother who loved him so much, that she gave her life trying to protect him. And when his lifeless little body washed ashore, he still wore his shoes. We can make a difference. You can make a difference. 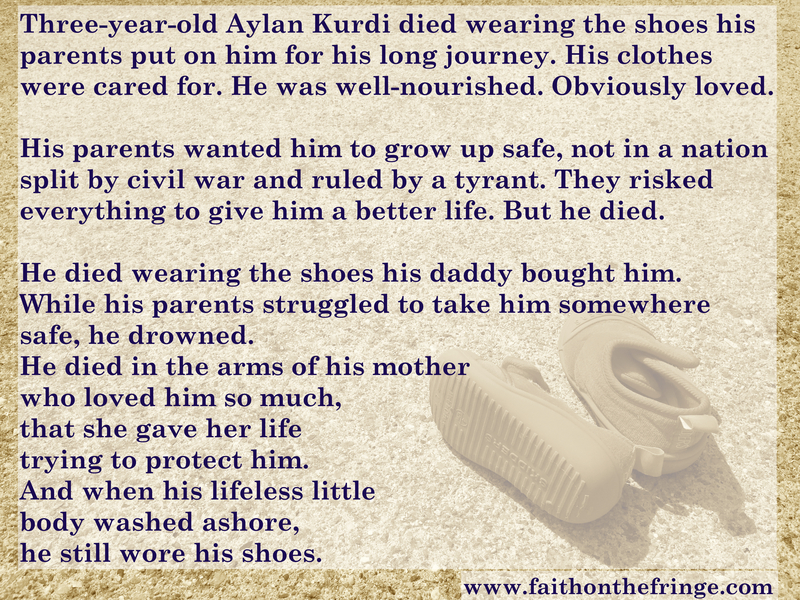 In recognition of Faith on the Fringe reaching 500 likes on Facebook, and in memory of Aylan Kurdi, I invite you to join me in helping Syrian refugees. The link below will help you help Syrian refugees through World Vision. I have supported a child in Hatti through World Vision for more than eight years, and my goal here is modest — $500 in recognition of 500 Facebook likes. What value is our faith, if we don’t use it to help others? To help save the next Aylan Kurdi? This entry was posted in in the news and tagged Aylan kurdi, syrian refugees, World Vision. Bookmark the permalink.